Sometimes as we travel down life's highway we cross paths with a truly unique individual, and that was my good fortune when, in the late 1960's, my life intersected with Vince Marinaro. For a few years Vince and a group of his friends from Pennsylvania made a yearly trek to fish Michigan's Au Sable River and it was during this time that we met. While I don't recall the exact details of how that first meeting came about I had the privilege of fishing with him, joining him for dinner on several occasions, and over the intervening years corresponding with him. The personal letters, audio tapes, and the autographed copies of his books are some of my most treasured earthly possessions. Vincent C. Marinaro was born in 1911 in western Pennsylvania, and over the next 75 years he never strayed very far from his Pennsylvania roots. He lived most of his life in Mechanicsburg, in eastern Pennsylvania located in the heart of Pennsylvania's legendary limestone country. Here Vince spent many hours on his beloved Letort. Vince was more than just a fly fishing genius; he was a corporate tax specialist, a classically trained violinist and the master of 11 languages. He was a good cook, and I enjoyed excellent pasta and fresh green salad with garbanzo beans at the cabin along the banks of the Au Sable that Vince and friends called home while they were fishing. Vince enjoyed a good cigar and the atmosphere at that cabin was filled with cigar smoke, the aroma of pasta sauce, and a shared camaraderie of brothers of the angle. Irascible, opinionated, but in my experience always the gentleman. He made an indelible mark on fly fishing. A Modern Dry Fly Code was his first book, but when it was published in 1950 fly fishing was experiencing the dark ages, and in its first printing it was not a great success. Fortunately this masterpiece was reprinted in 1970, and helped to usher in the modern renaissance of fly fishing. In this book Vince broke new ground in fly construction, raised the terrestrial insect to major importance, and raised questions about how trout perceive our imitations on the surface of the water. Vince introduced the idea of using minuscule flies, or as he called them 'minutae,' to imitate the vast number of tiny insects that make up the bulk of the insect biomass. Fishing with very small flies was practiced by a few Pennsylvania limestoners, and Vince opened the door to this method of fly fishing to a much wider audience. 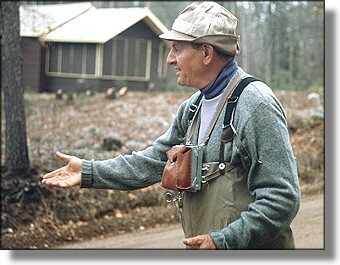 As important as all of these things were, Vince's greatest contribution to the world of fly fishing was the introduction of the thoraxstyle of tying the dry fly. This was truly an American innovation that moved the wing of the fly back on the hook, used a unique style of hackling that did not obscure the wing, and utilized widely split tails for stability. Vince experimented with a variety of tying techniques that resulted in such flies as the jassid, and spinners tied with porcupine quill bodies. In the Ring of the Rise, published in 1976, Vince demonstrated another of his many talents when he explored, in detail, the actions of a trout rising to an insect. Page after page of sharp, detailed photographs show all the stages of a trout's rise, and the photographs of the trout's view of a fly moving into its field of vision are unequaled. Vince taught himself the art of bamboo rod making, and I have a bodkin handle in my fly tying cabinet that is a short section of a bamboo rod that Vince gave me. Vince built on the foundation that others had laid, but he was also a great innovator and many of his ideas were revolutionary. Well versed in the history of angling he was quick to give credit to those who had preceded him, and like all true innovators he had an insatiable curiosity, an inventive mind, and a willingness to break with tradition. While Vince was not the most prolific angling author what he wrote is among the most profound and insightful in all of fly fishing literature. In his book, American Fly Fishing, A History, angling historian Paul Schullery made the following comments on the importance of Vincent C. Marinaro to the angling world.